Have you planted your summer flowers yet? What better way to dress up your landscape than with beautiful summer flowers that will flourish in Maryland heat? If you are looking to add some flair to your yard, flowers will always be excellent option. 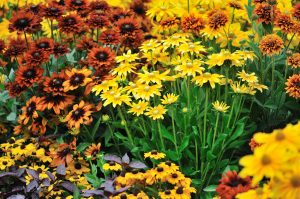 If you can’t decide which flowers to add to your landscape, consider these five options! These are an extremely popular option during the summertime because they require very little maintenance. These bright colored annuals are available in brass, copper, and gold. They can withstand hot temperatures and flourish in the sunshine. Once they bloom, they should remain looking bright throughout the entire summer. When most people think of summer flowers, this one is usually one of the first ones that come to their minds. As the name suggests, they require ample amounts of sunlight and can tolerant heavy amounts of heat. They are annuals that are gorgeous when they bloom. When their centers ripen, they produce seeds that can be harvested! Did you know that the color of hydrangeas varies due to the aluminum ion contents in the soil? They can feature a variety of beautiful colors such as vibrant pinks, pearly whites, powder blues, and shades of lavender. Most people do not know that shades of blue grow best when they are in growing in acidic soil. The reds and pinks do better in neutral or alkaline soil. In some cases, there can be a variety of colors within the same plant. They are easy to care for and can grow in almost any soil; however, they thrive in porous soils. Hydrangeas bloom in late spring and last until the beginning of autumn. The Maryland state flower is a charming addition to any garden. They are another low-maintenance option that can grow up to three feet tall! Butterflies and bees are attracted to this species of flower because of its nectar. Daisies are simple and innocent but are an incredibly beautiful species of flower. They are also a reliable option, as they will always return the following spring. A word of caution: some daisies need to be controlled because they can quickly take over a landscape if you are not careful. This is because they thrive in practically all conditions and are unharmed by most bugs. This entry was posted on Sunday, July 15th, 2018 at 1:31 pm. Both comments and pings are currently closed.